The first thing you�ll notice when you arrive at El Ombu is that, unlike some other estancias, this is actually a working farm. Herds of cattle graze contentedly in the outlying fields, gauchos look after the dozens of horses resting in the shade near the stables, and fields of wheat and soya stretch out as far as the eye can see. The second thing you�ll notice is that although it�s a working farm, it is also extremely comfortable. The original estancia (horse ranch) house from 1880 is still standing, renovated on the inside but with many of its original touches. The tiles that line the wide verandahs have been here for decades, the gently crumbling plaster of the railings looks like it grew with vines entwined around it, the silver taps and bathroom fittings are heavy and solid, the way things used to be made. That�s not to say it�s stuffy, oh no � the rooms themselves are high-ceilinged and airy, with extremely comfortable beds and cable TV with a range of English and Spanish channels. The couches, chairs and loungers dotted around the verandahs and pools are the perfect place to while away a few hours in the shade, with nothing but green pastures to gaze at, and a chorus of birdsong to listen to. That�s the beauty of a place like El Ombu: it has retained enough of its original flavour that it does not impact negatively on its environment. All the horse wrangling and farming is done by hand, so there�s no noise pollution. No noise pollution means an abundance of bird and animal life. An abundance of bird and animal life means constant musical accompaniment and a deep sense of peace for guests arriving all strung-out from travels and city life. All you need to do is wake up in the morning, to the sound of birdcall, and wander through to breakfast in the charmingly decorated restaurant (hung with antique lamps and armadillo shells and photographs of the most famous horse-tamer, Oscar, still working on the farm). A breakfast of toast, medialunas (sweet croissants), yoghurt, cereal, fruit and tea or coffee will ease you into the morning. From there, you can go for a horse ride if you wish (in summer it�s too hot, but winters in San Antonio apparently dip as low as 0 degrees Centigrade). There are also two pools, one right next to the bedrooms, one looking out over the fields, and table tennis, board games and snooker, if you feel like a bit of competition. Before lunch each day there�s a gaucho show of some description, either a display of horse whispering or some form of horse racing or the Argentine version of polo. Very entertaining, and an important way both to keep the gaucho skills in the area alive, and to practise for the annual Tradition Day in San Antonio de Areco, where gauchos from all over compete in parades of gaucho skills. Lunch is taken either in the restaurant or, if you�re lucky, under the trees on the front lawn. We were lucky enough to feast in the shade of the ancient trees, as a seemingly endless choice of parrilla (barbeque meat) was brought forth � steak, ribs, chicken, every kind of grilled meat you could imagine � accompanied by empanadas (delicious meat-filled pies), potato salad, green salad, coleslaw and fresh bread. And then homemade ice-cream to round off the meal. Delicious. Then it�s time for some musical entertainment, either a Spanish guitarist with accompanying songstress, or a full band with traditional dancers. 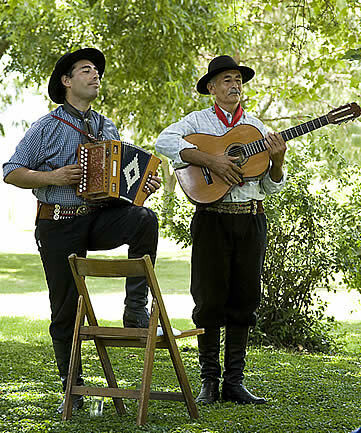 Unusually, though, it doesn�t feel like the kind of artificial song and dance put on for tourists, because the musicians are so involved in their music, and all those who work on the estancia clearly recognize the songs and dances. It feels like a slice of authentic Argentina, served under the trees, in the dappled sunlight, with song. Simply wonderful. Summer afternoons are particularly scorching, so we spent most of our time seeking refuge in the shade of the wide tiled verandah, or next to the pool. Once the sun starts to dip around 6pm, it�s time for a sunset horseride, definitely one of the highlights of staying at El Ombu. 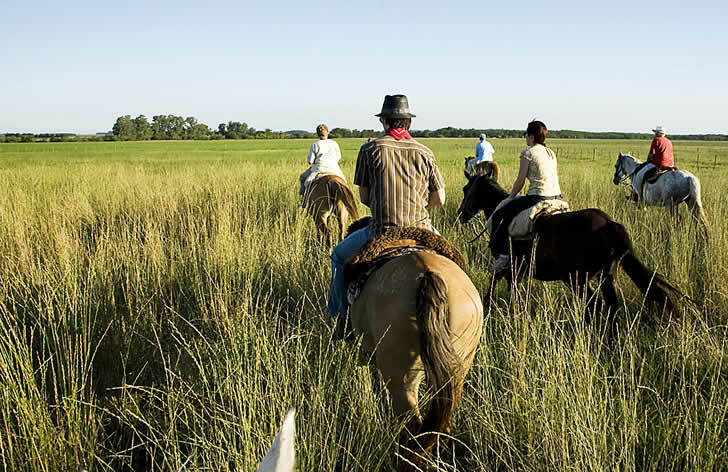 Along with two gauchos, guests take the horses out for an hour and a half ride through the surrounding fields, into scenes that could be taken from a 1950s book on The Pampas of Argentina. Vast, sweeping fields with big sky vistas; herds of cattle being rounded up by gauchos on horseback; shady forested areas with dozens of horses grazing quietly; a gaucho chasing a cow with a lasso, and catching him. Trotting through the golden light of the fields, dust rising from the horse�s heels, a river running through the multi-hued grasses� It�s moments like these that stay with you forever. After the horseride there�s just time for a sundowner before dinner, a communal three-course affair set out under the stars, and accompanied by much laughter and travel stories from the other guests. For those who would prefer a solo dinner, it can be arranged, but by the time you�ve been riding together you�ll probably feel as if you�re dining with friends. And that, in a nutshell, is estancia life. Late nights spent drinking red wine under the stars with newfound friends, lazy mornings of medialunas and coffee, lunching in the shade of the trees, and riding through the sunset. 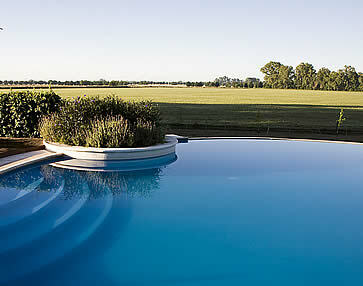 A working farm it may be, but it�s also the perfect place to take a holiday. Why not take a stroll or a ride? You�ll probably find it too hot to walk around much during the day as the distances are quite far. A horseride through the surrounding fields is simply delightful, though, and if you�d rather take a bicycle you can borrow one from El Ombu any time of day. 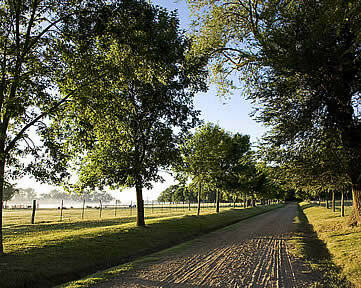 Setting A 300-hectare horse ranch twenty minutes from the historic town of San Antonio de Areco, and just over two hours from Buenos Aires. Why you'll love it The pace of life is extremely slow and relaxed. All you need to do is eat great food, relax in the shade of the many trees scattered around the property, take a dip in the pool, and perhaps go for a horseride in the late afternoon. 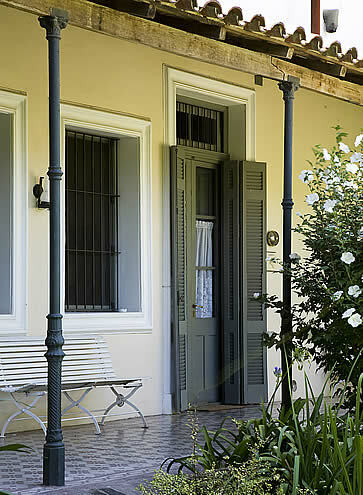 Good to know Ice cold water fountains are dotted around the verandahs to keep you hydrated in the fierce summer heat. All food and drinks are included (breakfast, lunch, dinner, red wine at lunch and dinner and spirits on request, as well as afternoon tea and cake). There is a public computer with internet if you need to check email, but no Wi-Fi. It is a working horse farm, so expect lots of flies. 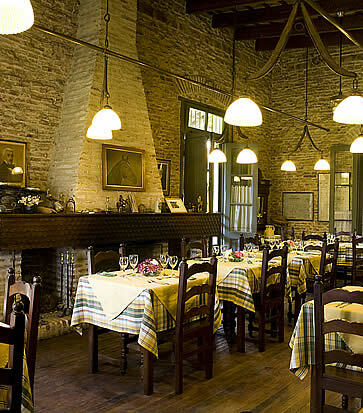 Lunchtime sees day trips of tourists coming to the estancia for lunch, but it adds a festive air to each meal. Wow factor It�s authentic. You really feel as if you�re part of a working estancia, because this is a working estancia. It feels like a slice of real Argentina. Best rooms or suites to book All the rooms are roughly the same size, all decorated in simple antique style with ceiling fans, all showing a little wear and tear (that simply adds to the authenticity). 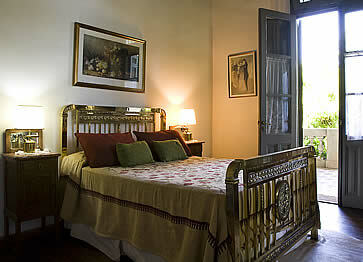 Some rooms can fit up to two extra beds for families, request on booking. The west-facing rooms catch all the afternoon sun and seem to trap the heat in the evening, so aim for the poolside rooms during summer. Room for improvement The claw-foot bath/shower is extremely pretty, but not very practical � there needs to be a shelf to place toiletries on while you shower (at the moment they have to sit on the floor of the bath). Also, a few of the other guests complained that their rooms (facing the sun in the afternoon) were so hot at night that they couldn�t sleep. Perhaps air-conditioning should be installed in the west-facing rooms to ease this discomfort. Rates US$160 per person, including all meals, drinks and horseriding. 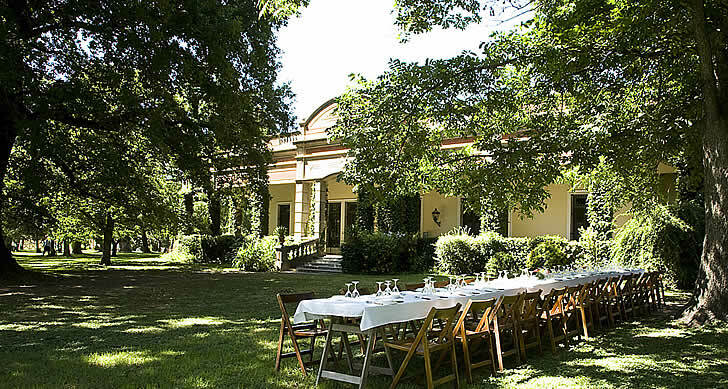 Address Ruta 31, Cuartel VI, Villa L�a, San Antonio de Areco, Argentina. How to Get There Fly into Buenos Aires International Airport and then either catch a taxi directly to El Ombu, or arrange for the El Ombu pick-up service: US$90 from Buenos Aires, US$115 from the airport. Travel Services Taxis can be arranged into San Antonio de Areco on request (about 20 minutes away). The town, although sleepy, is known for its artisans in silver and leatherwork.